Despite the growing popularity and influence of Japanese animation in America and other parts of the world, the importance of anime studies as audio-visual translation has not been well-recognized academically. 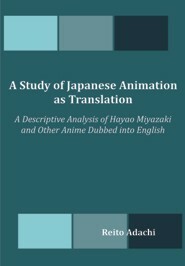 In order to throw new light on this problem, the author attempts to clarify distinctive characteristics of English dubs of Japanese animated films between the 1980s and the 2000s, including Hayao Miyazaki's, in descriptive ways: through a corpus-based statistical analysis of vocabulary and a qualitative case study approach to the multimodal text from a synchronic and diachronic point of view. Discussing how translation norms have changed on the spectrum from target-oriented to source-oriented, the author carefully examines what kind of shift occurred to translations of Japanese animation around the turn of the 21st century. Whereas the pre-2000 translations tend to give preference to linguistic persuasion (i.e., a preference for expository dialogue that sounds natural to the American audiences), the post-2000 translations attach higher priority to achieving dynamic equivalence of the multimodal situations as a whole. The translation of anime has been rapidly increasing its rich diversity these few decades, opening up new possibilities and directions for translating its unique visual and iconic language. Reito Adachi is a professor of English Language and Literature at Kurashiki City College, Japan. He holds M.A.s from Okayama University and Hollins University, and received his Ph.D. degree from Okayama University. His current research interests include audio-visual translation studies, children's literature, methods of teaching EFL through literature. A new proof of the theorem that every integral rational algebraic function of one variable can be resolved . . . Sometimes referred to as the Prince of Mathematicians, and greatest mathematician since antiquity, Gauss had a remarkable influence in many fields of mathematics and science and is ranked as one of history's most influential mathematicians. He referred to mathematics as "the queen of sciences". In his 1799 doctorate in absentia, "A new proof of the theorem that every integral rational algebraic function of one variable can be resolved into real factors of the first or second degree," Gauss proved the fundamental theorem of algebra which states that every non-constant single-variable polynomial with complex coefficients has at least one complex root. Mathematicians including Jean le Rond d'Alembert had produced false proofs before him, and Gauss's dissertation contains a critique of d'Alembert's work.